Here are a few videos to give you an experience of what you’ll learn on the Dru Yoga teacher training course. We believe a yoga teacher training course should prepare you to use – and teach – yoga to bring you success in any area of your life. Physically – get fit, lose weight, feel great, heal your back, improve your breathing, clear aches and pains of every kind, boost your energy, clear fatigue… well, we could go on… Did you see our research results? Emotionally – want more courage? Or more compassion? Tolerance? Ability to feel confident under pressure? Gain more passion or inner balance? Dru will do it for you! Mentally – think of a quality you’d like to have more of e.g. clear thinking, creativity, excellent memory, sensitivity, wisdom, good communication, being more grounded or lighter than air… There will be a Dru Yoga sequence or posture to cultivate exactly this within your mind. A helpful set of skills to have, wouldn’t you say? This excerpt from the Dru DVD, Feel Great Look Radiant, lives up to its name. Transform any painful emotions into positive ones, feel fit and get back on the highwire! Want to rest in stillness and know that you’re more fit as a result? Relax into the Sitting Twist posture with us. If you aren’t already warmed up, please only move as far as is comfortable for your body. Dru’s motto is, ‘no pain, no pain.’ Enjoy! On the Dru Yoga teacher training course you’ll learn Dru’s innovative and powerful approach to relaxation: relaxing each layer of awareness in turn – physical, energetic, emotional and mental. Dru Yoga teacher training includes a complete meditation course. Here’s just one example of the many potent meditations you’ll learn. Dru Meditation is for busy people! 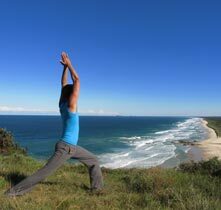 Experience the joy and benefits of Dru Yoga in your living room. Dru Yoga Online offers everybody the chance to experience the relaxing and revitalizing pleasure of Dru Yoga at just a click of a button. With classes by Dru’s top international tutors, the Dru Online Studio will fill you with ideas and best practices for your yoga classes. Class topics cover just about everything – from a great workout and a total de-stress, to soothing relaxations, weight loss series and confidence boosters. Use the studio for inspiration, to get ideas for your own classes or just to have a warm friendly voice in the background. Once you become a Dru Professional Network student member, you get the first four months free, and a greatly reduced subscription from then on. We want you to succeed as a fantastic yoga teacher!